Buteo was first mentioned by Pliny the Elder in his Naturalis Historiæ, trans. H. Rackham (Cambridge, MA: Harvard University Press and London: William Heinemann, 1952), bk. 10, ch. 9, referencing Greek priestess of Delphi Phemonoe, via Aristotle‘s Historia Animalium, published in The Works of Aristotle, eds. J.A. Smith and W.D. Ross, trans. D.W. Thompson (Oxford: Clarendon Press, 1910), iv, 592b, 620a. The reference is to triorchis, the bird with three testicles, the flight of which would be used to interpret omens. Pliny regards buteo as the Roman equivalent of triorchis since ‘one perched on an admiral’s ship with good omen’. In the sixteenth century, Conrad Gessner, the so-called Swiss Pliny, wrote about buteo in his magnum opus Historiæ Animalium (2nd edn., Frankfurt am Main: Excudebat Ioannes Wechelus, 1585; repr. Frankfurt am Main: In Bibliopolio Andreæ Cambieri, 1604), iii, 45–48; as was his wont, Gessner summarizes various names for buteo used in different European regions (more about this in a future post). As a name for the genus, Buteo was first described by French naturalist Bernard Germain de Lacépède (in full: Bernard-Germain-Étienne de La Ville-sur-Illon, comte de Lacépède), who was curator and chair of zoology at the Jardin des plantes, home of the Muséum national d’histoire naturelle, Paris. Each year he would deliver opening and closing addresses to the academy, which would be published subsequently. 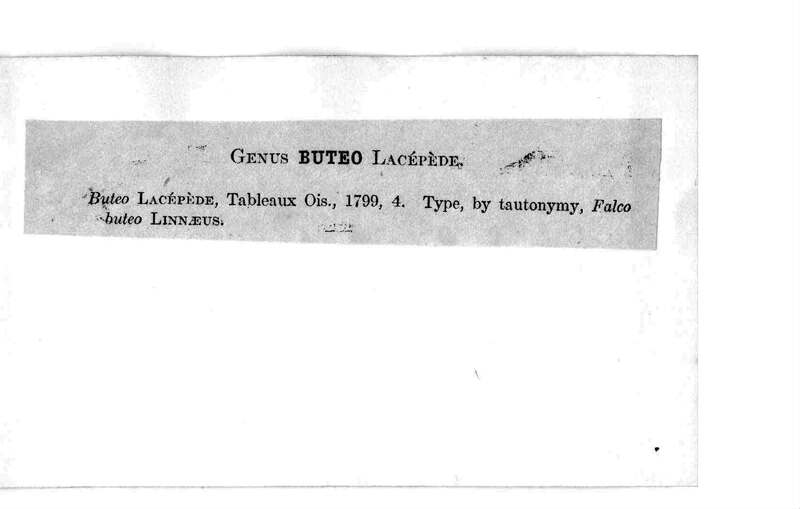 The 1799 publication contained a number of lists (tableaux), one of which contained Buteo, ‘Nouvelle table méthodique de la classe des oiseaux’, reprinted in M.A.G. Desmarest (ed. ), Œuvres du conte de Lacépède (2nd edn., Brussels: Th. Lejeune, 1833), i, 188–194 at 189. Cape Verde Buzzard – Buteo bannermani = Bannerman’s Buzzard – for Scottisch ornithologist David Armitage Bannerman – described by Harry Kirke Swann in his A Synoptical List of the Accipitres (Diurnal Birds of Prey) (London: John Wheldon, 1919), ii, 44, as Buteo buteo bannermani – split from Buteo buteo (2000 recommendations) – range: Cape Verde Islands – Portuguese (Cape Verde): Asa-curta = Short-wing. Jackal Buzzard – Buteo rufofuscus = Rufous-brown Buzzard – from Latin rufus = rufous, and Latin fuscus = brown, dusky – described by Polish naturalist Johann Reinhold Forster in his F. le Vaillant’s Naturgeschichte der afrikanischen Vögel (Halle: Fried. Christoph Dreyssig, 1798), 59–62, as Falco rufofuscus – range: Namibia and South Africa. This entry was posted in names and tagged archer's buzzard, augur buzzard, broad-winged hawk, cape verde buzzard, common buzzard, eastern buzzard, ferruginous hawk, forest buzzard, galapagos hawk, gray hawk, gray-lined hawk, hawaiian hawk, himalayan buzzard, jackal buzzard, long-legged buzzard, madagascan buzzard, mountain buzzard, red-necked buzzard, red-shouldered hawk, red-tailed hawk, ridgway's hawk, rough-legged buzzard, rufous-tailed hawk, short-tailed hawk, socotra buzzard, swainson's hawk, upland buzzard, white-throated hawk, zone-tailed hawk. Bookmark the permalink.